All of us who were momentary excited about LA in the 1970s on Mad Men can now redirect our attention to Aquarius, which will feature LA in the late 1960s. 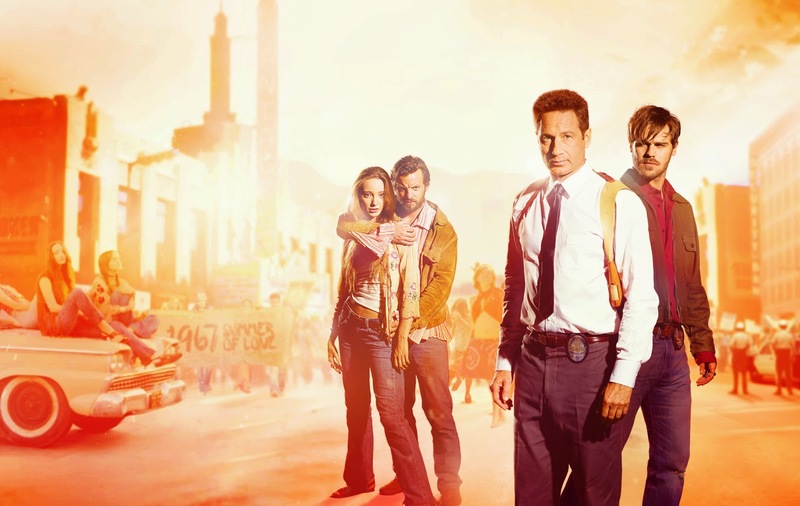 Aquarius Stars David Duchovny as Sam Hodiak, a LAPD homicide detective from the previous generation, who is investigating a missing girl. The story is tied in with the Manson family ( or the Manson Brothers, as Meredith on Mad Men calls them). It's retro and serial killer...I think a network exec just died and went to heaven. Even if it is riding a decidedly petering out wave of TV genre and based on nothing but the trailer I'm gonna say this looks like a winner. I also like that it is on network TV so it can't go to that gratuitous sexual, violent, sometimes both at the same time, place that cable often feels the need to. 2 hour series premieres Thursday May 28 on NBC and already has a straight to series order for 13 episodes. Here is the network description and trailer. ENJOY! Sam Hodiak (David Duchovny, "Californication," "The X-Files"), a decorated World War II vet and homicide detective, barely recognizes the city he's now policing. Long hair, cheap drugs, rising crime, protests, free love, police brutality, Black Power and the Vietnam War are radically remaking the world he and the Greatest Generation saved from fascism 20 years ago. So when Emma Karn (Emma Dumont, "Salvation," "Bunheads"), the 16-year-old daughter of an old girlfriend, goes missing in a sea of hippies and Hodiak agrees to find her, he faces only hostility, distrust and silence. He enlists the help of Brian Shafe (Grey Damon, "True Blood," "Friday Night Lights") - a young, idealistic undercover vice cop who's been allowed to grow his hair out - to infiltrate this new counterculture and find her. The generational conflict between the two is immediate and heated, yet they're both dedicated officers and soon realize the need to bring Emma home is more urgent than they foresaw. The immediacy arises because she has joined a small but growing band of drifters under the sway of a career criminal who now dreams of being a rock star: Charles Manson (Gethin Anthony, "Game of Thrones"). Ringing with the unparalleled music of the era, "Aquarius" is a sprawling work of historical fiction that begins two years before the 1969 Tate-LaBianca murders. It's a shocking thriller, a nuanced character drama and, in the end, the story of how we became who we are today. Writer John McNamara ("In Plain Sight") serves as executive producer with Marty Adelstein ("Prison Break"), David Duchovny and Melanie Greene. "Aquarius" is a production of Tomorrow Studios. Update: NBC will be making the entire season of shows available on NBC.com, The NBC app, and all other VOD platforms after the 2 hour premiers tonight. The future is here and apparently it is all about binge watching. Well the 6th TCM Classic Film Festival has come and gone and it was, as always, spectacular. I had a great time seeing films, listening to classic film panelists (including Peter Fonda, Shirley MacLaine, Anne Coates, and Errol Flynn's daughter) and hanging with all my gray scale comrades. There are a lot of questions you hear over and over again at the TCM Film Festival, "What are you most looking forward to at the Festival? ", "Who is you favorite star of classic film? ", etc... They all stump me. Maybe because I have no origin story for loving classic film. 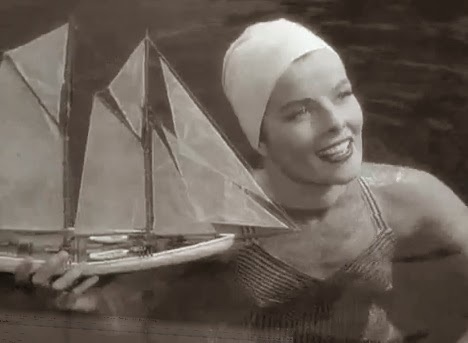 I feel like everyone I spend 4 days with every spring in Hollywood to worship classic film with have a moment they can point to and say that's when I started loving "old movies". Based on their moment they can pick a favorite star who played a role in their transformation from normal human to, as Will McKinley calls it, Old Movie Weirdo. For me, I don't remember a time I didn't love old movies. It's impossible to pick a moment of transformation. It's entirely possible I was born this way. I do know however that classic films have been the background to my life and in the same way that certain music triggers memories for some, classic films are inextricably tied to various moments and people in my life. For instance, I can't see AFRICAN QUEEN without thinking of my father, my mother comes to mind when I see SUNDAY IN NEW YORK, and as I explained in this years TCM film festival #HeartMovies video PSYCHO for my first mini romance. In many cases classic film has helped me through difficult times in my life. This particular weekend of the 2015 TCM Classic Film Festival I was struggling with my daughter's first trip away from home. While she was off on Catalina island frolicking with her friends I could have been home having a major anxiety attack about all the possible calamities that could befall her while out of my reach. Instead I was mercifully rescued by my drug of choice, classic film. Instead of chewing my nails or pulling out all my eyebrows I watched film after film in distracted bliss. 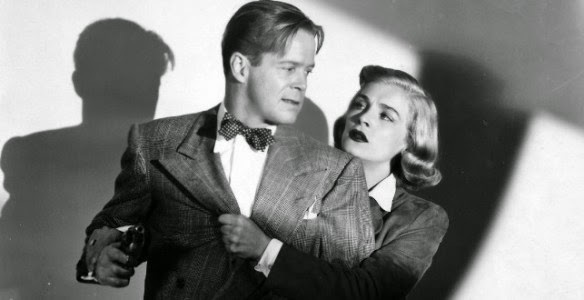 Who can obsess about their children when Tracy Lord is explaining what "yar" means in PHILADELPHIA STORY, or Dan Duryea is getting out noired by Lizbeth Scott in TOO LATER FOR TEARS. TCM and classic film definitely saved me, for probably the millionth time. The TCM Classic Film Festival is owed a big thank you this year from my friends and family for sparing them this mother's anxiety that they would have been tasked with assuaging, if it weren't for the film festival. So in the words George M. Cohan spoken by James Cagney in YANKEE DOODLE DANDY "Ladies and gentlemen, my mother thanks you, my father thanks you, my sister thanks you and I thank you." 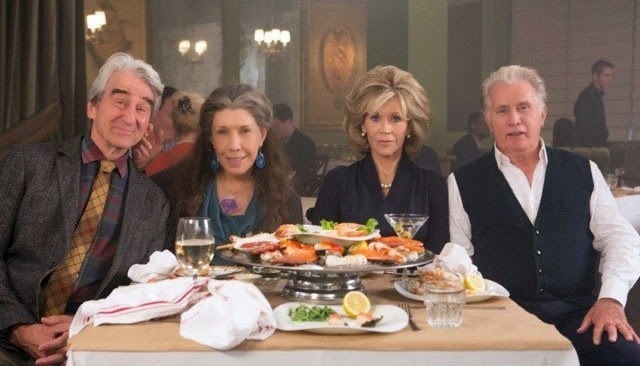 Netflix is releasing Grace and Frankie May 8th. Make note of that I will be completely off the grid that day to binge all 13 episodes. Just look at the cast and you know it's going to be amazing. Lily Tomlin and Jane Fonda play the wives of two men who announce they are in love and want to get married. Afterward they develop a "friendship" to cope with their stages of grief for their respective marriages. I have no problem believing hilarity will ensue. I could watch these four read the phone book, but this looks to be a very funny situation set in a painful life transition. 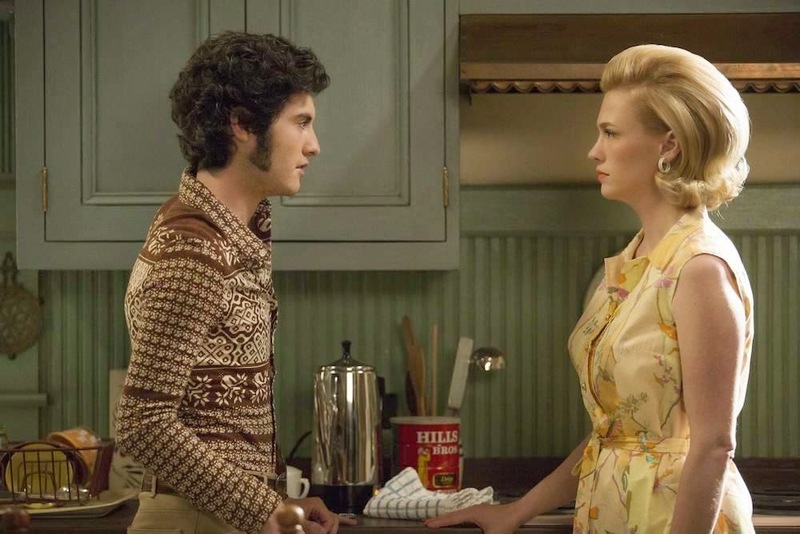 Mad men returned last night for it's final episodes. 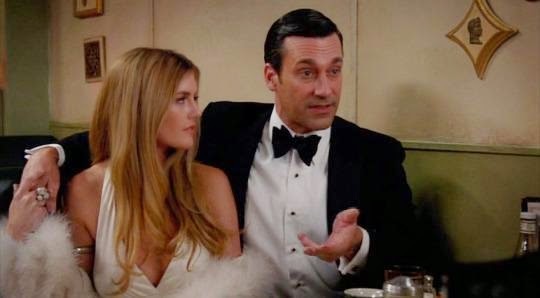 I had hoped that all the money from being bought out by McCann Erickson and the character developement we saw in our Mad Men friends brokering that deal would result in better/happier people for these last episodes...NO DICE. It's almost 10 months later (April 30, 1970) and we're back to the same old issues. Don seems to have revert to his miserable self where he just drowns everything out with liquor and women. He is talking about his childhood but he is sugar coating it a bit, changing the whore house to a boarding house. Still it does seem he is integrating his personas as everyone has suspected would be the case. He is still going by Don Draper though, so that cat is in the bag. Equally disappointing is Roger's return to his womanizing, though he seems to have cut back to one at a time, telling the ladies above he'll have to take one of them home. I was imagining he and Mona rekindling their marriage. Based on last nights episode that is not the case. Further it looks like McCann has more of a hand in the management of the agency with the firing of Ken. They said Ken had to go and out he went. Of course Ken can hold a grudge with the best of them and will be making his former employers lives miserable as the new head of accounts at Dow Chemical. So much for that novel. 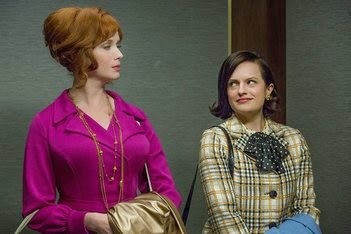 We got a look at a day in the life at work for Peggy and Joan and it wasn't too pretty either. Joan is still just an object to men. She has all this money and power but they can still belittle her. Hope she doesn't blow all her money on retail therapy. Peggy seems to be carrying on in her usual fashion though she still seems to be looking for love. I would love to see this thing with Stevie work out for her. She can be quite mercurial and a guy who will take veal when he ordered lasagna may be just the ticket for her. Finally, we got to find out what happened to Rachael Menken. She got everything, the job, the husband, the kids and then she died of Leukemia way too young. So sad and probably just an affirmation for Don to keep "living like there's no tomorrow, because there isn't"